The original Oral B toothbrushes like the Pro 1000 had incredible benefits. It still continues to be a leader in electric toothbrushes. The company has built upon those beginning stars to make some of the best toothbrushes in the world. 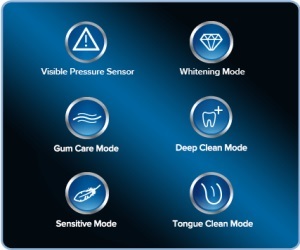 Oral B electric toothbrushes have advanced brushing technology like their various cleaning modes. They have so many great features in each of their toothbrushes. They deliver stronger teeth, healthier gums, and less plaque. Choosing a particular toothbrush model from the oral b line up can be a bit confusing. 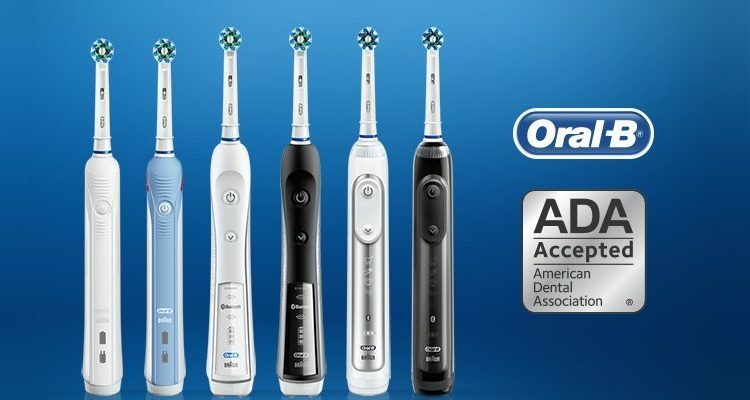 We break down all the technology that Oral B has to offer its customers. You’ll be able to read about all the features and benefits. After reading all about Oral B, and everything they offer, you’ll be making a more informed choice. It’s important to make an informed choice because you can’t neglect good oral hygiene. 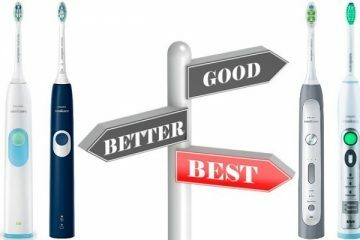 Let’s compare each of their toothbrush models to discover all the features and benefits. The line of Oral B electric toothbrushes from Braun have an oscillation, rotation, and pulsation technology. 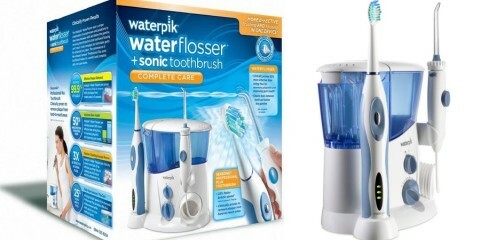 The brush head surrounds each tooth and vibrates while rotating. Electric toothbrushes from Oral B can deliver over 48,000 movements per minute. At 48,800 movements per minute, you’re getting 97,600 movements when brushing for two minutes. That’s the time that dentists recommend you spend brushing. Each Oral B toothbrush has at least one brushing mode. Many of them have multiple brushing modes. There are 6 modes available across the devices. There’s Daily Clean, which is the clean commonly used daily. The Gum Care massage mode. That’s used to stimulate the gums. The Sensitive mode is a lowered power for those with sensitive gums and teeth. There’s a Whitening mode that shines and brightens your teeth. The Pro-Clean was previously known as Deep Clean. It removes more plaque and film from your teeth. Lastly, there’s Tongue Cleaner. This is used to remove food and bacteria that’s hiding on the surface of your tongue. Each cleaning mode has a brush head pairing that works together. The Daily Cleaning mode works well with any of the brush heads. The Sensitive mode works better with the Sensitive brush. The Whitening mode is enhanced with the 3D White brush. FlossAction and CrossAction enhance any of the cleaning modes you choose. These are standard and deliver good brushing and flossing action. Most Oral B toothbrushes come with one or two brush heads. The rest can be easily ordered as needed. The Oral B line of toothbrushes come with a timer that will count off two minutes. This is the time that the American Dental Association recommends for brushing. They know that brushing for two minutes gives the best results. During that two minutes, there’s a pacer that will alert you when it’s time to move from one area of the mouth to the next. It keeps you from missing any of your teeth – especially those in the back of the mouth. 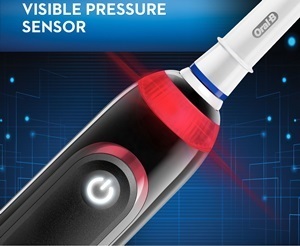 There’s a Pressure Sensor in the Oral B toothbrushes that will alert you when you’re brushing too hard. Aggressive brushing is truly damaging to your teeth and gums. It comes from people using a manual brush. They’re not getting a good amount of cleaning because they don’t have the power. Manual brush users believe that scrubbing is the only way to clean. With over 48,000 movements per minute, Oral B electric toothbrush users are getting clean without scrubbing. The Pressure Sensor will retrain users who are used to brushing aggressively. It’ll stop moving or stutter to alert the user that they’re brushing too hard. Oral B has delivered gum protecting technology in many forms. First, their toothbrushes have more plaque removal features. The circular nature of the brush itself is meant to remove plaque along the gum line. That makes for healthier gums. They also have a Gum Care cleaning mode on most of their toothbrushes. It’s this mode that massages the gums to stimulate blood flow. Healthy blood flow to the gums can repair damage. It can also keep them from being damaged. Lastly, the Pressure Sensor tells you when you’re brushing too aggressively. Hard brushing on the gums can cause gum recession. That leads to serious issues with your teeth as you age. The latest models from Oral B have Position Detection. It uses facial recognition to “see” your mouth. The front-facing camera on your phone or tablet is where the facial recognition software acquires its target. With this technology, the software and the toothbrush work together to ensure that you’re brushing all your teeth. 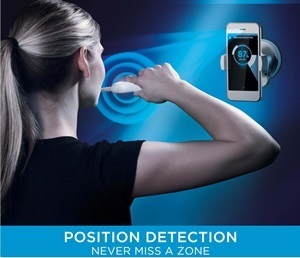 It’ll visibly see where you’re brushing and show the positioning in the app. It’s an incredible advancement in technology. This compact unit acts as a clock when you’re not using it for your teeth. 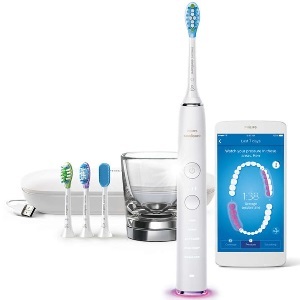 Once you turn it on, it works with the Oral B Bluetooth-enabled brush. It’ll show a timer and give you feedback on your use when brushing. Some of the older models have this Smart Guide for tracking your brushing. It’ll show you a cleaning mode, mouth quadrants, and the correct time for each quadrant. The guide will give you a smile face for good brushing habits. The battery life of the toothbrushes are really incredible. You’ll get between 12 and 14 days of battery. The length of the battery will depend on the amount of brushing and how many people are using one handle. Many of the Oral B toothbrushes have dual charging. It’ll allow you to charge your toothbrush and your smartphone or tablet. That’s important when you’re traveling. You don’t need to block more than one plug or port with your charging needs. The shape of the brush heads were inspired by the circular head used in the dentist office. Theirs is a small, round brush that surrounds each tooth to get all the edges. It’s easier to remove plaque with this design than the long square brush head on a manual toothbrush. The reason that Oral B removes a large amount of plaque comes down to the features. It has the patented round brush head. That cups the entire tooth when brushing. It was inspired by dentists since they use that type of brush professionally. There are modes of cleaning focused directly on plaque removal. The brush heads focused on plaque removal can also be paired with the cleaning modes. Deep Cleaning from the Pro-Clean option is ideal. There are more than plaque removing brush heads. There’s a brush head for whatever your oral care weakness. Let’s say your dentist wants you to focus on plaque, but you want to also focus on teeth whitening. You can get the brush head for plaque removal as well as the whitening one. 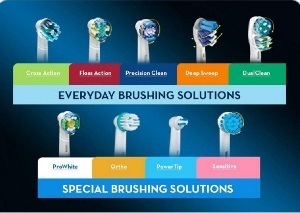 The brush heads can be customized for your oral care needs as well as the cleaning mode. The gum massage mode can be paired with the brush head for sensitive teeth. You can pick exactly the type of brush head and cleaning mode will benefit you most. The app can be downloaded for your smartphone or tablet. It’ll keep track of all your brushing habits. There are a few good reasons for this. That gathered data can be brought to your dentist when you go for cleanings and checkups. It can also be used for real-time tracking. You’ll be able to see exactly when you miss areas of your mouth. The company has received the American Dental Association’s Seal of Approval. The ADA updated their guidelines in 2017 to be more strict. After vigorous testing, the ADA Seal was granted to the Oral B line of power toothbrushes. It’s quite a validation for a toothbrush company. To get the Seal, the company had to meet dental standards. It allows dentists to recommend these products wholeheartedly to their patients. The Tongue Cleaning mode can be paired with any of Oral B’s brush heads. Not every toothbrush model has this option, but it’s a good one. Food and bacteria can hide in the tongue’s crevices. Cleaning the tongue removes anything hiding there, which reduces bad breath. It’s important to brush your tongue at least once per day. The entire surface of the tongue should be scrubbed. That’s easy to do with the dedicated cleaning mode found on many of Oral B’s toothbrushes. With a Whitening cleaning mode and a whitening toothbrush head, you’re going to get more whitening in a shorter amount of time. If you pair the cleaning mode and brush head with whitening toothpaste, you could have a whiter smile in just a few days. The 3D White toothbrush head uses bristles to remove the stains on the surface of your teeth. In the middle of the bristles is a polishing cup. The bristles surround the tooth while the cup makes it brighter and whiter. The Oral B line of toothbrushes provides fantastic benefits with all their features. They do more than clean your teeth. Even the most basic of their toothbrushes provide great cleaning power. The patented round brush surrounds each tooth while the oscillations and rotations do all the work. They have an app that helps you track your progress. That data can inform future brushing plans. Aside from the cleaning, the features will give you benefits like healthier gums. There will be less plaque along the gum line. You’ll have fresher breath and whiter teeth based on the modes you choose in your Oral B toothbrush. 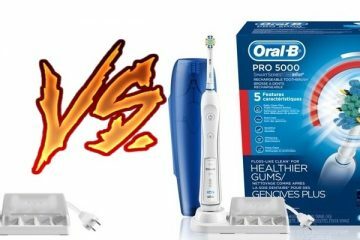 Oral B 500 vs 1000 vs 1500 : Which Is Right for You?